Within a month of moving in, the home’s HVAC system failed—kickstarting their work on the home. The Giesers opted to replace the unit with a highly rated Seasonal Energy Efficiency Ratio (SEER) system. This energy-efficient move was followed by the replacement of the original garage door, which—as a major component of the home’s exterior—the couple did not want to skimp on style. The previous owner installed a pond in the courtyard, where the Giesers’ turtle, Mikey, now lives. 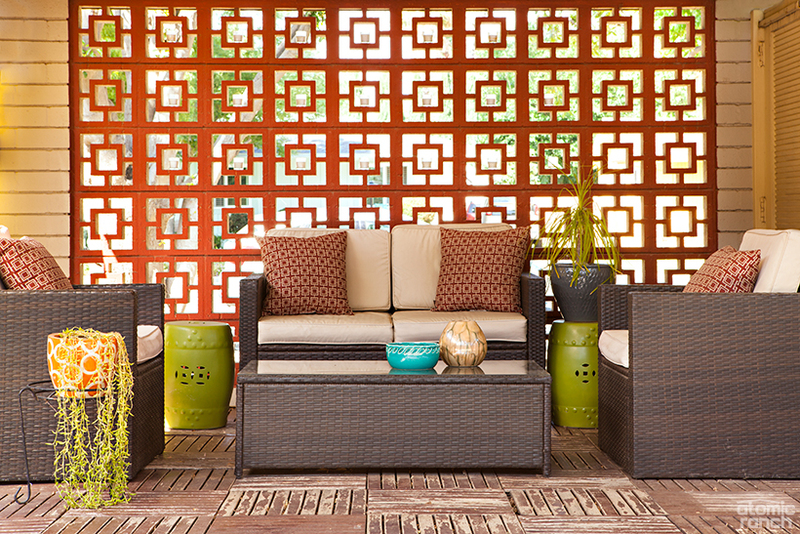 Summer created an entertaining-ready seating area in front of the original breezeblocks with contemporary outdoor furnishings and votive candles tucked into the bricks. “The garage door was the original commercial Porvine door, but after years of use it was ripping apart,” Scott says. “I contacted the original manufacturer and had an exact spec door built.” The custom, 20-foot-wide commercial roll-up rang in at $3,000. As the Giesers were only the third owners, their home had retained much of its original charm. Yet when leaks started threatening the family with stains on their Venetian plaster walls, Scott and Summer had some difficult decisions to make on how to rescue their home from its original galvanized plumbing. “The remodel was very difficult, mentally. 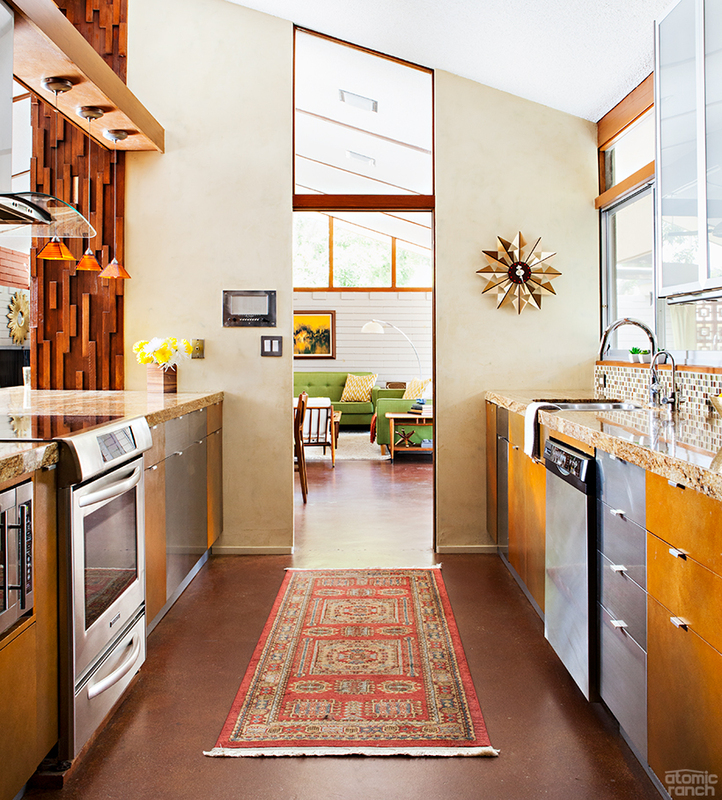 We have so many original features in the home, and we wanted to keep them all,” Scott said. In August of 2015, the remodel process began with new plumbing. The couple had to make tough calls on what items in the home they were willing to break or dismantle so as to access the leaking pipes hidden in their walls. “We had the original small yellow tile in both bathrooms on the countertop, backsplash and shower surrounds,” Scott said. Despite the pain of removing the yellow bathrooms, Scott and Summer had to move forward with replacing the plumbing. Since the original tile would be damaged in the removal process, they decided to create new, modern spaces. Their design decisions were primarily guided by what they believed to be staying “true to form with the original design,” had the original designer been working with currently available materials. 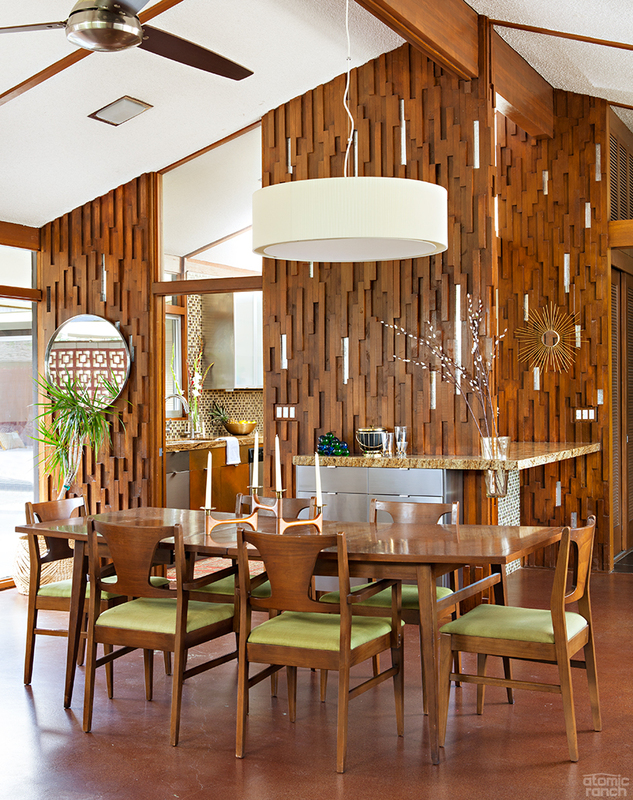 Intricate wood paneling steals the show while drawing the eye up to the high ceiling and original beams. White 4-by-12-inch subway tiles installed in a straight line stacking pattern in the showers set the stage for the clean-lined bathrooms. Dark grey floors, white quartz countertops and real wood backsplashes complement the original walnut cabinetry—which they painstakingly cleaned and maintained with their original hardware. While uncertain if the home was originally designed with concrete floors, the previous owners stained them a rich brick red—which the Giesers have kept. The only exceptions are the tiled bathrooms and their son’s room, which has retro-inspired carpeting. 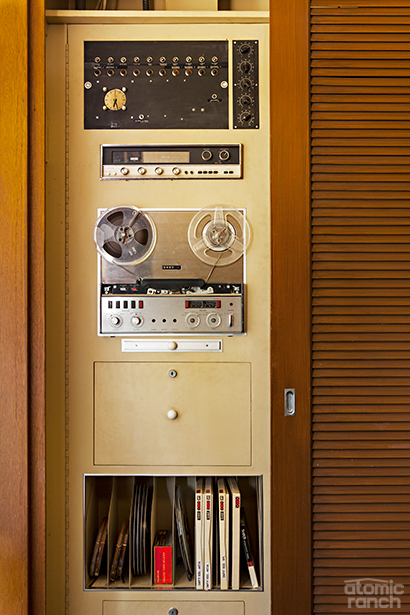 The cabinets aren’t the only original features the Giesers were able to save. 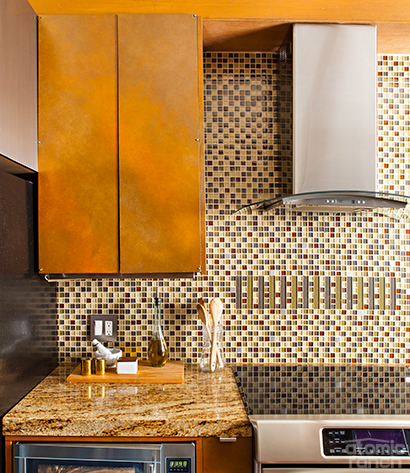 The couple designed the backsplash and shower tile around the original Hall-Mack toothbrush and soap holders. Lovingly restored with elbow grease and chrome polish, the Hall-Mack medicine cabinets, toilet paper holders and scale holder all glisten in their new, sensitively designed bathrooms. The previous owners chose to remodel the original kitchen, but rather than completely toss the existing fixtures, they salvaged the walnut cabinet and drawer fronts and reinstalled them on new, custom-made cabinets. Metal and glass front doors were used on additional cabinets, such as the floating buffet in the dining area. As the home is a medallion home, it features all electric appliances. Despite early-on projects, intensive bathroom renovations and continued restoration, the Giesers never wavered in their love for their midcentury home. 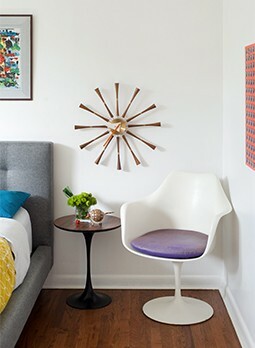 They hunted flea markets, thrift stores and antiques shops for authentic midcentury furnishings, soon filling the home with items such as Shield Chair Company white leather lounge chairs, Lane coffee and end tables and a vintage arc lamp. Not having luck finding appropriately scaled matching sofas for their living room, Summer custom-designed two perfectly citrus-hued showstoppers for the room that span 8 and 7 feet in length.